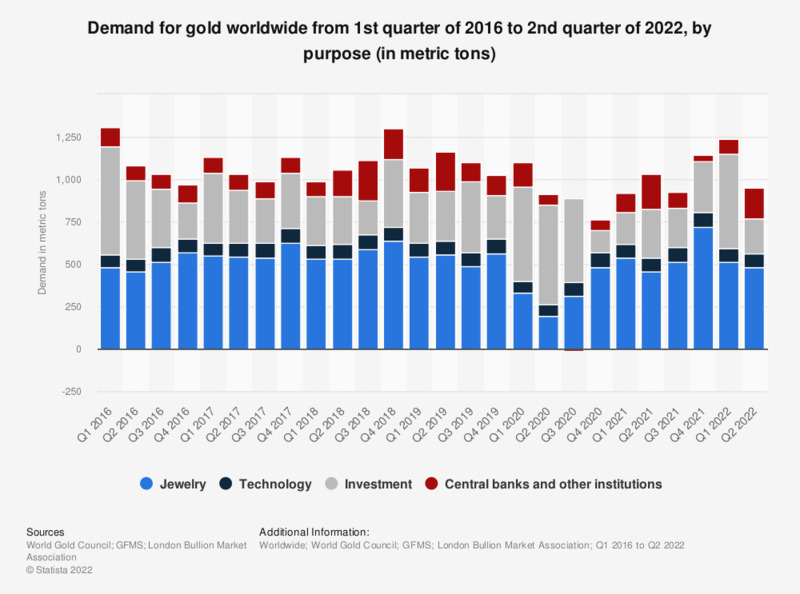 The statistic shows the quarterly figures for the global demand for gold from the third quarter of 2014 to the fourth quarter of 2016. The demand of gold for investment purposes amounted to approximately 335.7 metric tons in Q3 2016. Throughout history, gold has been desirable and in demand and has been characterized as a high value commodity. When investing in any commodity, risk assessments need to be taken into consideration. Generally gold is considered to be a safe investment. It becomes an attractive means of money allocation especially in times of turmoil on the financial markets. Also governments locate a big part of their assets in gold. The United States was the leading gold holding country worldwide as of December 2016, with gold reserves amounting to 8,133,5 metric tons. The demand for gold globally in 2015 was valued at 4,212 metric tons, with jewelry being the largest receipient of this precious metal. Everything On "Gold as an investment" in One Document: Edited and Divided into Handy Chapters. Including Detailed References.